"Music that lifts the spirit can be intensely joyful, profoundly moving, and unforgettable. Ekstasis is committed to creating juxtapositions and similarities through daring programming. We thrive on the contrast, intensity, and passion that we find in these compositions. We aim to share music that electrifies our audience and offers every possible emotion on the spectrum." 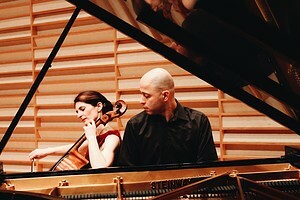 Natasha and Eliran met as students years ago at Juilliard. After some recent exciting performances in New York City and upstate NY, the two decided to embark on a new mission: to create compelling programming celebrating masterpieces alongside the secret jewels of lesser-known works. The duo will perform concert programs that tell a story, ruminate on the human condition, or set an atmosphere through sound. These programs offer solo works alternating with chamber music, and occasionally will expand to include friends and the use of multimedia, such as readings, video, and visual art. Through this kind of programming, Ekstasis seeks to create a more cohesive and interesting curated experience for the audience.